I started with a Windbrisk Heights (hiding away an Enduring Renewal). I played Tymna on turn 3 and a Keening Apparition on turn 4. Atraxa started with a Hardened Scales and also cast Manifold Insigts. T/L played Blind Obedience. A Reforge the Soul shuffled up our hands. I played some small creatures (Herald of Anafenza, Tithe Drinker, etc) and an Elspeth, Sun’s Champion. I got my Enduring Renewal on turn 11 and cast Fleshbag Maruader several times, until Atraxa Mortified my Renewal. Vial Smasher smashed me pretty hard a few times, and then the board was wiped. I cast Ravos and rebuilt my board a bit, but a giant Atraxa cast an Overloaded Cyclonic Rift (a card I am definitely starting to HATE), and there wasn’t really much that could be done after that. I did some fun stuff in the game, but the ending was anticlimactic. Mostly the plan is to have a lot of small creatures, have Ravos pump them and bring them back for value, and attack a lot. Tymna helps draw more stuff. I’m glad to have a W/B deck that isn’t basically a Lifegain deck (even if Tymna does like some lifegain). In honor of finally having “official” 4-color options, I’ve decided to give my pre-playtest opinions on the new 4-color Partner configurations. I’ll start with how I think they work together and give them a score on Compatibility from 1(least) to 4 (most) with only one “4” being awarded, and a score on how likely I’d be to build them as a pair (1 = no, 2=unlikely, 3=possibly, 4=yes) with no gaurantees. Note that additional card choices/deck context could improve compatibility, but I’m not going to go too deeply into that, though I may mention brief ideas. The Non-green “theme” is “Artifacts”, My current xG Tag-Team deck is Zedruu/Syg “Alt Wins“. 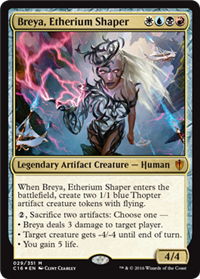 Would I play: 4, Since they didn’t want to give me a UR Artifacts Matter commander for this pile of “Thopters Matter’ cards I’ve had ready since Origins, I’ll happily add in a bit of white and black and just use this beauty. 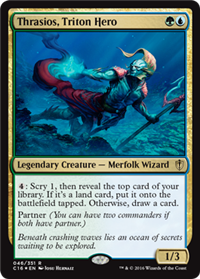 Definitely my favorite of the “true” 4-color commanders..
= Both play well with artifacts, and Silas IS an artifact. = no real compatibility other than Ishai’s casting cost is actually nice with Vial Smasher. Would I play: 2 , If I had a non-artifact plan for these colors. They could swap with Zedruu/Sygg okay. = No real connection, except Ravos buffs everyone . = Both involve the words “life” and “draw cards”. You get a bonus card if you hit for combat damage. = Ravos Buffs Kraum, which is cool, and they both fly, so evasion? = They both involve drawing cards. Kraum’s evasion means maybe a Tymna trigger. In honor of finally having “official” 4-color options, I’ve decided to give my pre-playtest opinions on the new 4-color Partner configurations. I’ll start with how I think they work together and give them a score on Compatibility from 1(least) to 4 (most) with only one “4” being awarded, and a score on how likely I’d be to build them as a pair (1 = no, 2=unlikely, 3=possibly, 4=yes) with no guarantees. The Non-red “theme” is “Growth”, which means a headache of +1/+1 counters. 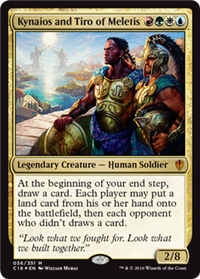 My current xG tag-team theme is “Legendary Colors” with Zur and Sisay. 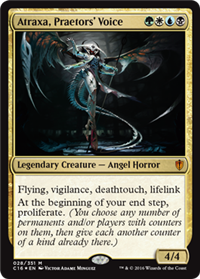 Would I play: 4, because I’ll probably build all of the “True” 4 colors, and this one is really good, but WHY DID THE 4-COLOR ANGEL HAVE TO BE THESE COLORS! = Ishai, might get bigger so Ikra might let you gain some more life. 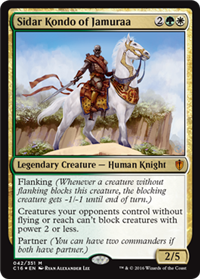 = Both play with +1/+1 counters, and if Ishai has a counter on it, at least you won’t have earned it for naught if she goes to the Command Zone. Compatibility: 4 but only because they fit more with the “growth” theme than Sidar/Silas. Would I build: 3 , They’ll be the Built-in party ticket for Election.dec. = Sure, Silas Renn can be harder to block. Would I play: 3 , but only because they will be Running Mates on the Friendly ticket for Election.dec! = No real interaction, other than Thrasios being card filtering, then again Ravos automatically works with any other creature (which is why he is the winner of best Partner). = They both involve drawing cards, but not much overlap other than that. Would I build: 3, I think this is the X-over party ticket for Election.dec for ballot box manipulation and door-to-door canvassing. = Kydele might help cast another Ravos. Would I play: 2. They are dark-horse candidates for being on the Election.dec ticket. = If you can get through for some damage, Kydele is activated. Would I play? : 3, but only because I’m sure I’ll build a ‘true’ 4 color deck with each of these generals. = Sidar encourages your opponents to attack, and to attack someone other than you, which triggers Ludevic for them. = Both are on “theme”. 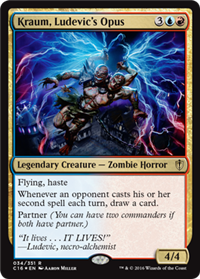 Sidar encourages your opponents to play multiple cheap creatures in a turn, maybe? = Maybe you draw another artifact? = Maybe you draw something worth beefing up? . = Artifacts cost colorless mana. = Kydele can help you cast a big creature for Bruse to Buff. Would I build: 2. This is the only combo that I would maybe put at the helm of the Angel deck. In honor of finally having “official” 4-color options, I’ve decided to give my pre-playtest opinions on the new 4-color Partner configurations. I’ll start with how I think they work together and give them a score on Compatibility from 1(least) to 4 (most) with only one “4” awarded, and a score on how likely I’d be to build them as a pair (1 = no, 2=unlikely, 3=possibly, 4=yes) with no guarantees. The Non-blue “theme” is “ATTACK”. My current non-blue tag-team is “Token Sacrifices” with Kresh and Hazezon. 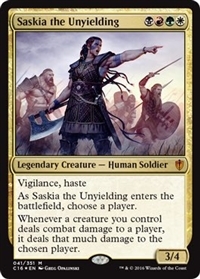 Would I build: 2, I mean, probably a “3” but I don’t like having a commander that totally singles out one player. She might be fun in a “Curse” deck though, so yeah, okay, “3”. = Buff a trampler, get more opportunities at Saprolings that are Buff. Seems Good. Would I build: 4 This is very likely to replace Kresh/Hazezon in my current Tag-Team. = More things to attack with, means more things might get through. = You’re playing small creatures, so Maybe that means you have mana for big other spells? = Akiri doesn’t get more toughness. = Putting Counters on Akiri seems decent. = Bruse targetting Ikra means 14-28 life. That’s crazy. Would I play: 4. These two will probably get their own deck. = Reyhan will make things bigger, and bigger things with Double Strike is good.